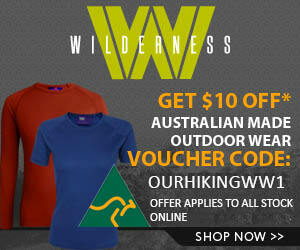 This is a guest post by Neil Fahey from Bushwalking Blog. Neil does a lot of hiking (mainly day-hikes around Melbourne) and shares in-depth trip reports on his blog. He has also recently written a few stories for Great Walks Magazine. If you’re an Aussie hiker then you probably already know and love Great Walks Magazine. If you’ve never heard of it, now is as good a time as any to head out and buy yourself a copy. Need convincing? Well read on and you might be persuaded. 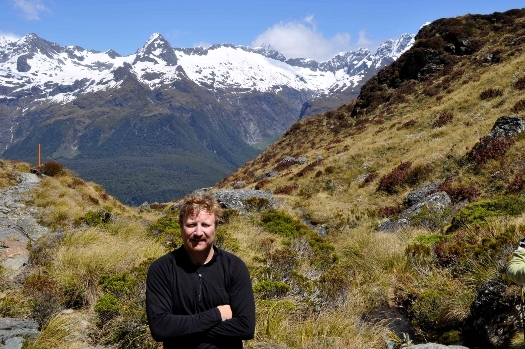 Brent McKean has been editor of Great Walks for several years now and is obviously a very keen hiker. I recently asked him to participate in a brief e-mail interview, thinking it would be a good opportunity for Our Hiking Blog readers to find out a bit more about another interesting outdoors enthusiast and also about the magazine. So what came before Great Walks for you Brent? How did you end up being the editor? I used to work in banking but it was always just a means to an ends. I was looking to do a job I was passionate about so after spending a year hiking around South America I decided to go to uni and get a journalism degree. I graduated from the University of QLD just after my 30th birthday and my first two jobs were back overseas. The first was working as a volunteer journalist for Amnesty International, reporting on human rights abuses in India, Nepal and China. That was incredibly confronting but it reinforced to me I had chosen the right career path. I then worked in the Middle East for 1.5 years as a journalist/editor. I was based in Oman but my job took me everywhere – all over the Arabian Gulf and to Europe and Africa. In ’99 I moved to Sydney and worked for AAP (Australian Associated Press) for five years working in hard news before moving back to magazines. I was deputy editor of car magazine Overland 4WD for two years before I got the job running Great Walks and I couldn’t be happier. Most of your readers probably think you’re the luckiest guy in the world, having a job that revolves around hiking. Is it as amazing as we think? Yes and no. Any editor will tell you running a magazine is very demanding. The buck stops with you. However, I do get to do some great trips (I was in Africa in April) and sometimes I shake my head when I think about where my career’s taken me so far. Generally I’ll be out of the office four to five weeks a year on trips. The rest of the time it’s head down, arse up. Your role as editor must have given you the chance to take off on some incredible hiking trips… Care to share a couple of your best and/or worst hiking experiences? My trip to walk the Milford and Routeburn tracks last December was brilliant. I’m from Auckland and spent most of my childhood walking or cycling around the North Island but I had always wanted to walk these two iconic South Island tracks. It was a dream come true and it didn’t disappoint. At the end of each day I found myself in some very nice lodgings, sitting besides an open fire, drinking a gorgeous NZ pinot. Life doesn’t get better. As for my worst hiking experience. Well I’ve had my fair share of challenges but I must admit a walk I did in PNG a few years ago really tested me. We were on the island of New Britain, walking an unmarked track retracing the steps of WWII Diggers. The walk was like Kokoda but more rugged and without a trail to follow. The terrain was some of the steepest I’ve ever walked and we were literally pulling ourselves up the track by grabbing tree roots. The rain was relentless, the path turned to mud and I had a full pack. By the end of the four days I was totally spent. I can’t imagine how our Diggers spent weeks in that unforgiving terrain. It was very enlightening. What do you set out to achieve with each issue of Great Walks? Does the magazine have a mission statement? 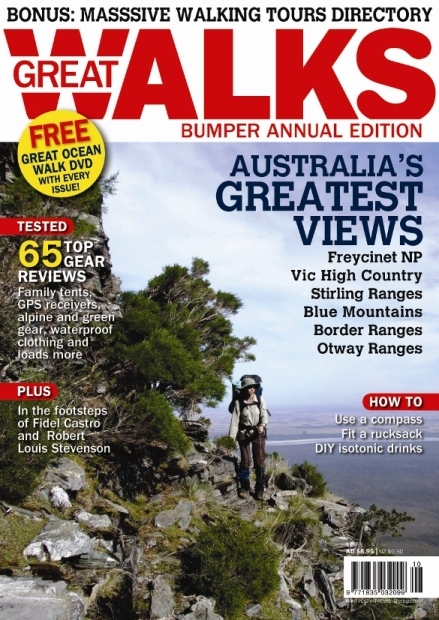 Great Walks is Australia’s only dedicated bushwalking magazine. Unlike other outdoors magazines we don’t try to be all things to all people. If you’re a bushwalker or are interested in taking it up hopefully you’ll buy the mag. With each issue we try to appeal to all types of walkers, from the beginner to the very experienced. Also 45% of my readers are women so I’m very aware of that when I look at gear to review. What I want to do with Great Walks is entertain, inform and inspire. Do you think the magazine has any role in advocacy for bushwalkers, or in speaking out about conservation and environmental issues? Definitely. We do look at social and environmental issues concerning bushwalking and the outdoors community. However, I’ve purposefully avoided making the mag an issues-based soapbox. Magazines like Wild do a great job creating social discourse on many environmental issues and I didn’t see the point in trying to emulate them. The news section of Great Walks is only a few pages but that way I have more space for what we’re really about – great walks! What can we look forward to from Great Walks in the coming year? Are there any particularly exciting stories or special editions planned? We’ve got some great stories coming up. In the Aug-Sept issue a mum and dad take their three kids (4, 7 and 9) on a 10-day walk of the Overland Track. I did that on my own a few years ago and that was interesting enough let alone with three kids in tow. The Oct-Nov issue showcases a brand new multi-day walk in WA (similar to Spain’s famous pilgrim walk) which I’m very excited about, and the Dec-Jan issue will feature our Christmas gift guide, which was really successful last year. I also have plans for a Great Walks cover photo competition early next year. You mentioned in the June/July issue of Great Walks that there is a website on the way. Can you tell us how soon we can expect that to go live and what you have planned for your online presence? The publishing company I work for Yaffa Publishing is rolling out websites for many of its 30 magazine titles. However I don’t expect www.greatwalks.com.au will be up and running until at least the end of the year, if not early 2011. When it does go live I think it will be a very dynamic website featuring walks, maps, gear reviews and lots of reader input. Stay tuned. By the way, I’m about to take a six-month break from running the mag to look after my baby daughter Matilda. My partner Holly and I decided we wanted Matilda to have a full-time carer for the first year of her life. Holly did the first six months, so now it’s my turn. I’ll be leaving Great Walks in the very capable hands of Richard Cann, a former Yaffa journalist who’s in the middle of training for Sydney’s Oxfam Trailwalker. I’ll be back at the helm in Feb next year. Great Walks can be found on the shelves of most good newsagents and Borders bookstores, or you can subscribe online at the Yaffa Publishing website. If you’re still not convinced, Yaffa provide a couple of sample pages on their website for you to preview. Thanks to Brent for taking time out of his busy work-schedule to answer my questions. We hope you have enjoyed Neil’s guest interview with Brent as much as we have. 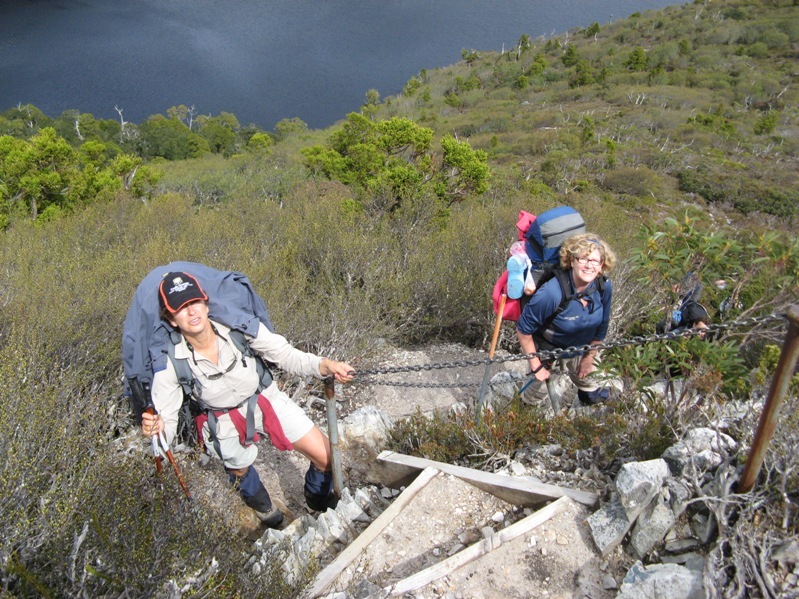 Don’t forget to check out Neil’s site Bushwalking Blog, especially if you are planning any day hikes around the Melbourne area. He goes to a lot of trouble to make the information accurate and does some very interesting trips. If you ever feel the urge to share an article such as a trip report, gear review or just musings about the outdoor world, feel free to contact us, we’d love to publish your work. Great mag! I subscribed a few issues back. I particularly enjoyed the article on the Stirling Ranges in the most recent issue. This mag is responsible for many entries on my ‘to do’ list.